The story of Radha offering Charanamrit to Sri Krishna shows the unparalleled love and faith that Radha had in Sri Krishna. One day Sri Krishna had fallen sick and no medicine was able to cure him. Sri Krishna then told the Gopis of Vrindavan that there is cure for his illness. Sri Krishna asked gopis to give him Charanamrit. He told them that if he drinks the water used to wash the feet of his param bhakt (supreme devotee) then he will be cured. The gopis were now confused. They all thought they were the greatest devotee of Sri Krishna. But they also had self doubt; what if their charanamrit fails. It simply meant that they were worried about exposing themselves as not one of the greatest devotees of Krishna. They were worried about the shame and failure. Radha soon heard about the whole incident. Without any thought, she immediately washed her feet and rushed with the charanamrit to Krishna. She was not bothered about her failure, future, stature etc. All she was bothered was that Krishna should be cured at any cost. Sri Krishna drank the charanamrit and got cured immediately. A true devotee has no self-doubt, neither is the true devotee bothered about society and stature. 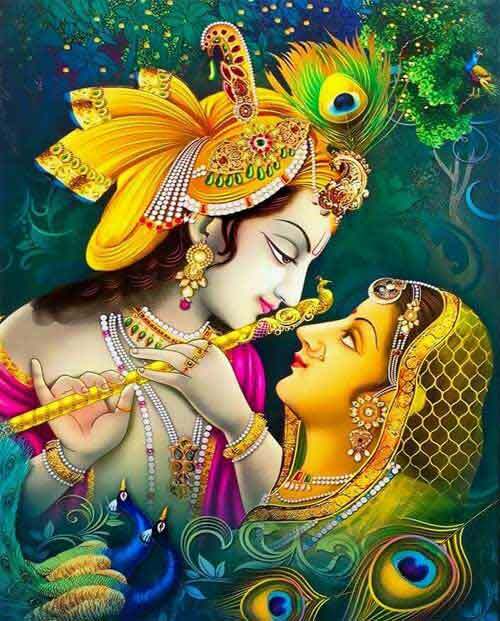 Radha only had true love for Sri Krishna. All other gopis had self-doubt.